A Brand New Stalkers Review?! What th -- ? A cool indie movie currently in limited release and available on pay per view, BLUE RUIN has the structure of your basic revenge film, but done with a different sense of style. The lead character, Dwight, is hardly a Charles Bronson surrogate. Instead, he's homeless, spending his time alternating between the beach, breaking into homes to take a bath and sleeping in his hideous blue car (hence "Blue Ruin"). Then things change. A friendly police officer informs Dwight that the man serving time for murdering Dwight's father is being released from prison. That sets in motion an escalating series of increasingly violent events that draws heat not only on Dwight but also his (innocent) sister. Even though Dwight is our nominal "hero", he does a lot of thoroughly non-heroic things, screws up repeatedly and ultimately makes some discoveries that suggest his quest for justice (or whatever it is) may actually be wrong-headed. The movie's also not about steely super soldiers. There's a very sensible scene in the film where an injured person tries to fix a wound on their lonesome, Rambo style, only to fail miserably and resort (sensibly!) to the E.R. You'd never see Stallone do that! Blue Ruin is very quiet for this sort of film, with several scenes of real tension that reminded me of the recently concluded True Detective series. There are a few eyebrow-raising moments (I'm either impressed or unnerved at how many people in this film don't seem particularly gob-smacked by murder) but overall it's a nice, tense piece of work. I liked it! A new (?) cable-ish network called EPIX is throwing up a bunch of really lousy 70's/80's horror and sci-fi that pretty much is like sitting in my living room circa that era and going through my VHS tape collection. Just randomly grabbing things, I found LADY FRANKENSTEIN (poor Joseph Cotten stars, "from Citizen Kane to THIS?! "), the Traci Lords version of Roger Corman's NOT OF THIS EARTH, Umberto Lenzi's grotesque zombie epic NIGHTMARE CITY (in subtitled Italian! ), and perhaps the most grotesque, WILLIAM SHATNER'S GONZO BALLET, a dance film based on William Shatner's musical collaboration with Ben Folds. The Shatner piece is recent, but the other stuff appears to be taken directly from the original fuzzy VHS copies. This is not some archival effort ala Blue Underground's Criterion-like restorations, but down and dirty and the exactly the way I remember them. Since the channel comes in over whatever crazy cable package I'm getting, I'm not sure what I'm paying for this stuff, but it's worth it! William Friedkin's SORCERER is finally out in a fully restored, approved by Friedkin blu-ray that looks AMAZING. The previous DVD was a pan and scan nightmare, but this edition has gorgeous color and is probably as good or better than the first 35mm prints. Released at the same time as STAR WARS and with an unfortunate title that promises some supernatural element that doesn't exist, this was considered a big disappointment back in the day -- but it is one of the best 70's movie out there, easily in my top ten of the time. A remake of the French film WAGES OF FEAR, this is a sparse, gritty crime/adventure drama with some of the most harrowing trucking sequences ever filmed. (I know what you're thinking, how can a "truck sequence" be harrowing? Watch this movie and see!) Anyhow, five stars, thumbs up, highest recommendation, etc. It's been awhile since I posted, partially out of ennui, being busy, being sick, and partially out of "can't think of anything to say." Sort of a conundrum for a guy who writes for a living, but hey, that's fiction. I suppose I could fill this up with imaginary tales ("After knocking the knife out of Don Rumsfeld's hand, it was just the two of us, mano a mano...") but no, I save that "brilliance" for paying customers. I've been taking some trips down memory lane recently as we clean out my parents house to prepare it for sale. My Mother kept EVERYTHING, including piles of old homework, stories, artwork, etc. As I flip through stacks of my old art pieces, I am vividly reminded why I switched to writer, but it's fun to look back at what my 13 year old brain was creating. 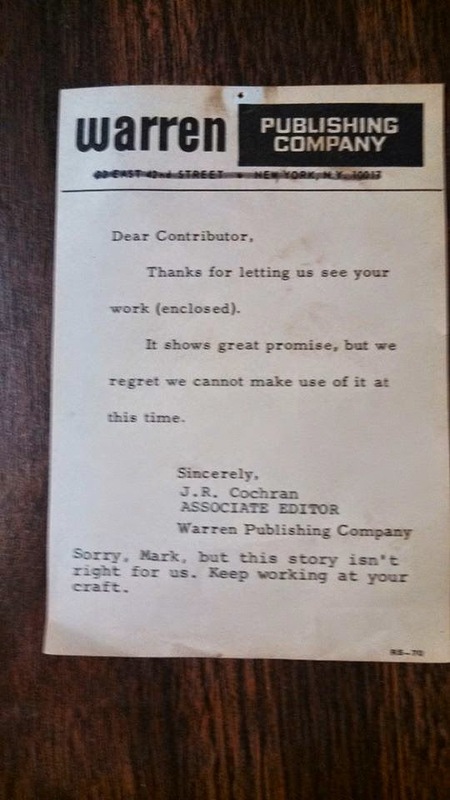 We also found some early rejection slips and other ephemera that only has meaning to yours truly. And still make me STEAMING MAD. Anyhow, I'll try to be back with work updates and reviews as the mood strikes. Meanwhile, happy Easter!